Frank Ross graduated from the University of Arizona with a Bachelor of Science in 1966 and a Juris Doctor degree in 1969. 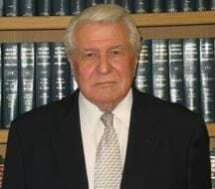 He has maintained an office in the Avondale, Goodyear, and Litchfield Park area since 1971. During his 40 years of practice, Mr. Ross has gained valuable experience in a wide range of legal areas. In addition to his law practice, Mr. Ross has served on the Boards of Directors of several community and charitable organizations. These affiliations have given him an appreciation for the problems faced by his clients, and the experience to approach difficult situations with a practical problem-solving attitude.